Last night (August 26) will live long in the memory of Peterborough Panthers fans, but not due to what they witnessed on the track. The city club’s 54-38 loss on their own shale against Newcastle Diamonds was, sadly, nothing out of the ordinary in an era where East of England Showground slumps have become all too common. But the latest home horror show, a sixth of 2016 in all competitions, proved to be the final straw for promoter Ged Rathbone. He reacted by announcing the departures of two riders and unveiling their replacements during the interval. The Panthers axe has fallen on second strings Tom Perry and Emil Grondal with at least a couple of other riders presumably left breathing a sigh of relief that they are not also seeking new employment. The double-switch involves the arrivals of Anders Thomsen and Danny Halsey, and already has the approval of the British Speedway Promoters’ Association (BSPA). 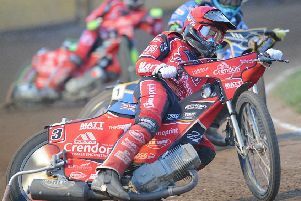 Thomsen is a highly-rated Danish rider who competes in the European Championship and also ended last year with Panthers, while Halsey has been in electric form in the National League of late. Those moves appeared to appease a set of supporters who were growing increasingly dismayed by the terrible display they were witnessing. Panthers conceded five 5-1s in the space of seven races to fall 18 points adrift of the Diamonds before Rathbone delivered his unexpected address. The magnificent Craig Cook did succeed in a 10th heat tactical ride, but even the impact of that was reduced by partner Grondal bringing up the rear in what proved to be his final ride for the club. Perry still had one more race to complete at the time his exit was made public, and he signed off with a second place in heat 12. That was his only scoring contribution of the night, but not enough to delay the inevitable for any longer as the 3-3 outcome in that heat put Newcastle’s victory beyond doubt. Rathbone said: “We had the blessing of both outgoing riders to announce the team changes at that time. “Letting people go is never an easy thing to do, but we did it at that moment to ensure Emil and Tom both received the send-off they deserved from the supporters. “We’ve known for weeks that we haven’t been performing well enough as a team, but it was a case of having to wait to make the right changes at the right time. “We feel we have strengthened the side by bringing in Anders and Danny, and hopefully their performances will prove us right. “For most of the season we have looked to be certainties to reach the play-offs, but that is certainly not the case anymore. We now have a hell of a lot of work to do to make sure we keep ourselves in the top six. Panthers dropped to sixth place in the Premier League table after losing last night. They’re four points above the Ipswich sit who sit immediately below the play-off zone. The main body of the team is where Panthers came unstuck against Newcastle. Cook out-scored rival number one Robert Lambert (a rider who knows how it feels to be sacked by Panthers himself) by 10 points, while the two sides both notched eight points at reserve. But they were found badly wanting in other areas as head-to-head scores highlight. Grondal could only manage one point compared to the seven gained by rival number two Victor Palovaara while Perry’s two points were put to shame by the 10 of Diamonds number three Matej Kus. And so it continued . . . Nikolaj Busk Jakobsen produced a paltry three points for Panthers as fellow number four Ludvig Lindgren piled up a dozen - a haul which included victory in heat 15 to deny Cook a deserved maximum. Skipper Ulrich Ostergaard, the only Panthers rider other than Cook to win a race, was also out-performed by his direct rival Steve Worrall as Panthers came up woefully short. Worrall set the joint fastest time of the season when winning heat four in 58.9 seconds – the same figure Cook had clocked in the opener. The meeting was followed by an impromptu fans’ forum as Rathbone and co-promoter Trevor Swales took questions from supporters in the main grandstand. They dodged no issues when talking openly about the team, preparation of the East of England Showground track and the short stay of former team boss Jason Attwood. “I pride myself on being open and honest,” added Rathbone. “It might not always be what people want to hear, but our supporters deserve to have full knowledge of what goes on at the club. A rapid upturn in form is essential if Panthers earn a tilt of honours, starting when Redcar visit the East of England Showground on Bank Holiday Monday (7pm). PANTHERS: Craig Cook 17, Ulrich Ostergaard 7, Zdenek Holub 4+2, Ashley Morris 4+1, Nikolaj Busk Jakobsen 3, Tom Perry 2, Emil Grondal 1. NEWCASTLE: Ludvig Lindgren 12, Matej Kus 10+1, Steve Worrall 10, Lewis Rose 8+2, Robert Lambert 7+2, Victor Palovaara 7+1, Danny Phillips 0.